One of the biggest budget busters in any home can easily be the grocery budget. With such a flexible item it can be quite easy to go over budget without a strict game plan. Now I am not saying to constrict yourself in a unrealistic way, however having a plan of attack set in place that is easy to follow can save money on groceries and quite a bit of it too. Whether you are shopping for one or a large family the same tips will always apply. Buy the food you need at the lowest possible price. If you are looking or ways to save at the grocery store this is a great place to start. This simple list will set the groundwork for some crazy savings. Get these tips down as second nature and you will be on your way to saving some serious money! Tip #1 Make and use a weekly menu. Now, I know what you are thinking. A weekly menu is nothing new. No, you’re right, it’s not. And that is what is so perfect about it! Taking a cue from our grandmothers is a great way to tap into our money saving ninja-ness. By creating and implementing a weekly meal plan you will not only save time but money too. Think about it for a second, if you know what you are making for dinner in advance you will be less apt to stop for takeout or pizza. Now, I can totally hear you rolling your eyes at me but wait. This simple tip has literally saved me hundreds of dollars every single month for YEARS. By spending just a few minutes every Sunday and laying down a dinner plan for the week I am able to narrow down exactly what I need at the store and stop blind shopping. Blind shopping is shopping without a plan. If you know what you need and only buy what you need, impulse purchases and over buying will be a thing of the past. Read: How to make a weekly menu and ensure you use it. Tip #2 Make sure you have fast food meals at the ready. If you are just not interested in making a weekly menu, no worries there are still other options to help you save. I have an arsenal of easy to cook meals on hand at all times. A go-to fast food and prep list that I can refer too whenever I need a little dinnertime inspiration. Take this tip one step further and always make sure you have the needed ingredients for these fast food dishes on hand. This way you know you will have a meal ready to go no matter what mood you’re in or what’s on the schedule that day. 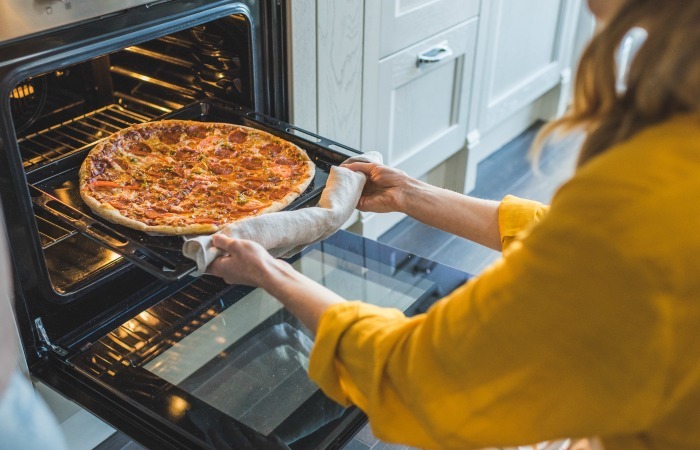 Read: How to make dinnertime easier without a meal plan. 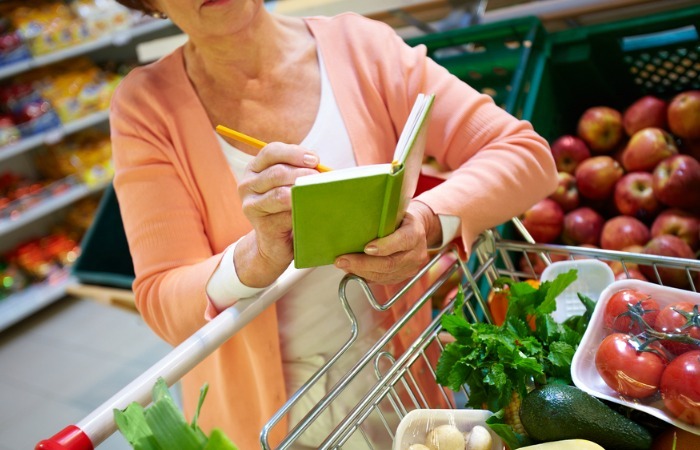 If you really want to save money on groceries, you need to have a list. Scratch that. I realize this is something you probably already do but do you actually stick to it? To make sure your grocery list is more than just a suggestion take it one step further and put your budget right on your list. Actually, write on your list how much money you have available to spend at the store and highlight it in yellow. Tell yourself that this number is set in stone. Cannot be budged. Has absolutely no wiggle room whatsoever. Tell yourself whatever you need to so that you do not under any circumstances go over that number! Then, take it just one step further and use your cell phone’s calculator function to keep a running tally of what you are spending. By going to all this trouble to ensure you know the importance of your budgeted store total, you will work hard to stay on track and under budget. You really need to think of your home as a company and a business, take your budget seriously at all times and you will be amazed at how much money you can save. Remember: A budget is a rule and not simply a suggestion. Ninja tip: Worried you may miss out on a deal? Keep a few dollars available for unadvertised specials. Stick a few twenties in the back of your wallet and paperclip it together. This money if for deals and steals only. Go just one step further and attach a note reminding you of what this money is earmarked for so you are not tempted to spend it elsewhere. Above all, you need to begin to think differently about how you shop and not feel deprived when you are at the store. You are there to buy food for your specific menu and not just randomly tossing items into your shopping cart. Been there, done that and paid with a credit card….eeeek! Read: How to make an insanely effective grocery list. Tip #4 Clip coupons only for what you need. In my experience, using coupons can just as easily break a budget as it can save it. Make sure to only clip the coupons for items you use regularly so you are actually saving money. If you are a coupon user, my best tip for you is this. Make your grocery list around the food you need then go after the coupons for those items on your list. Do not make a list based on the coupons you have. This will only fill your home with foods that your family may not want or eat and foods that may not be particularly healthy. Coupons should be a tool to sticking to your budget and not the driving force behind it. Tip #5 Shop only once a month. 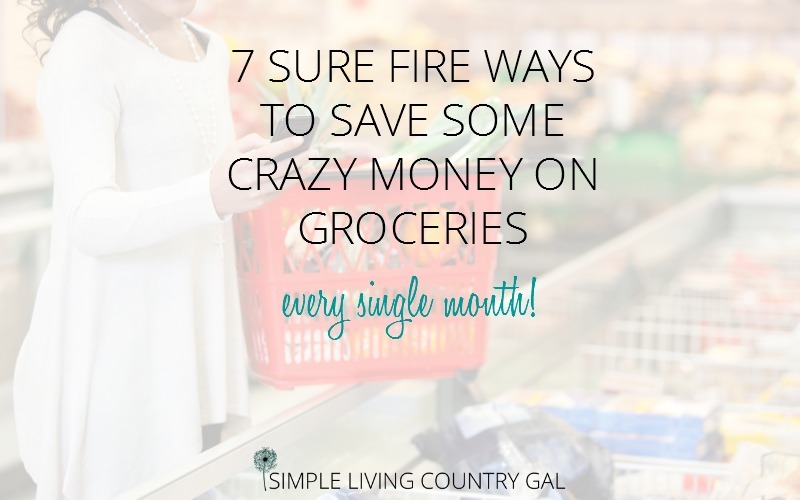 I have learned that the easiest way to save money on groceries is to simply stay out of the stores! The best way to do this is to do all of my grocery shopping just once a month. This does take time and some planning but it has saved me hundreds on my monthly bill. Yes, I am talking hundreds of dollars every single month!! Tip #6 Learn the prices of your main items. An oldie but a goodie tip is to create a price book. A price book is simply a list that you create that keeps track of the prices of items you regularly purchase from your favorite stores. I love this super simple tip and I have yet to meet a person that uses it and has not saved crazy money! Now you can outsmart the grocery stores and make sure you are always getting the best price when you are shopping. This tip alone will save you loads of money on your monthly bill. Yes, it takes some time to set up, but it is completely worth all the effort. Use this old school tip to save money on groceries every single time you are in a store. Read: How to set up a price book and get your free printable! Tip #7 Pick your top stores and learn them. My big 4 stores are Aldis, Wegmans, Sams Club and the local Mennonite store. I know when the deals hit and when my go-to items may be on sale. I also know where the products are I like to purchase at each store and I stick to those areas only. This really cuts down on impulse purchases that can quickly destroy a budget. Get in, get out and save. Saving money on your food bill is easier than you think. Arm yourself with a thorough list, stick to a specific game plan and always know your budget. These three tips alone will save you some serious money on groceries every single month. Go one step further and add on these other simply savers and take your grocery budget to the Ninja level. Great tips! We reduced our monthly grocery bill by 20% just from writing and sticking with a list. Not sure if you’ve got them in your area, but Sprouts (think Whole Foods at Aldi prices) has become our go-to grocery store. Definitely worth a visit if there’s one near you. I have not heard of Sprouts, what a wonderful store…I am so jealous! I agree with a list, it is a game changer for sure.